Agnontas in Skopelos. Accommodation. Restaurants. Port. 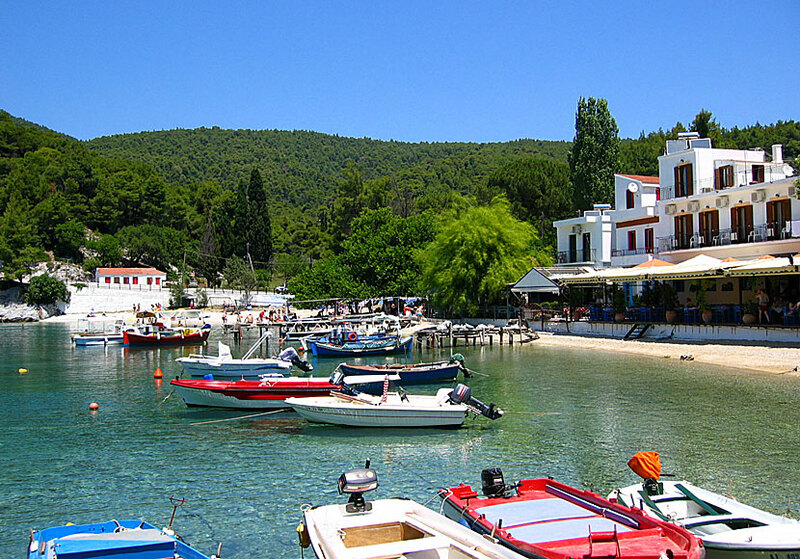 The adorable little fishing village of Agnontas about 8 kilometres south of Skopelos Town, and about 5 kilometres west of Stafilos. The distance between Stafilos and Agnontas is a real pleasure to drive. It is most beautiful if you drive from Agnontas to Stafilos, then you have the bay of Stafilos within sight. I have seen a countless number of Greek fishing villages, but the question is whether or not Agnontas is the prettiest of them all. 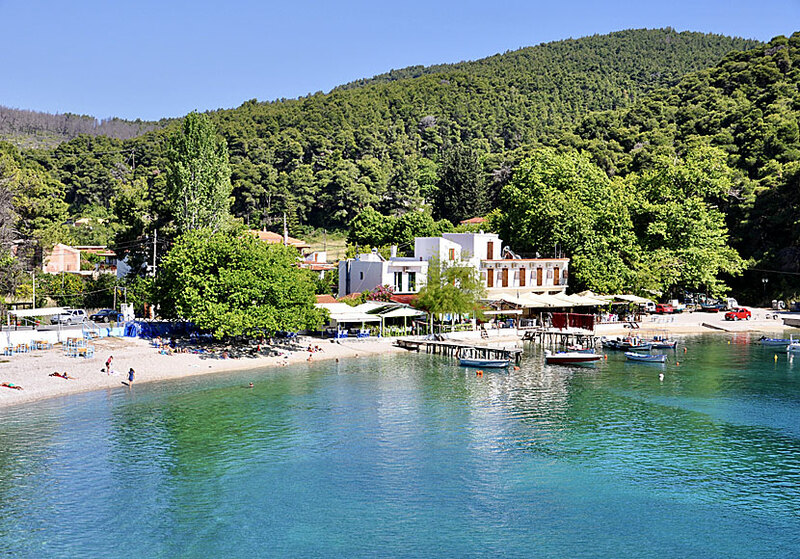 The setting is magical: hills covered with pine trees meeting the blue-green sea where it bobs colourful fishing boats, two wooden jetties leads out in the water from the beach, on the jetties one can sit and rest after a long lunch at one of the cosy tavernas. The beach itself is small and consists of small white stones. The bottom of the sea is nice at the edge of the water, but becomes pretty stony a little bit out. A quite unusual tree for Greece grows between two of the tavernas. The tree's name is Mexican Palo Verde or Jerusalem Thorn, and is native to Mexico. How the tree ended up on Skopelos is probably going to remain a mystery, none of the Greeks I talked to knew anything about the tree. 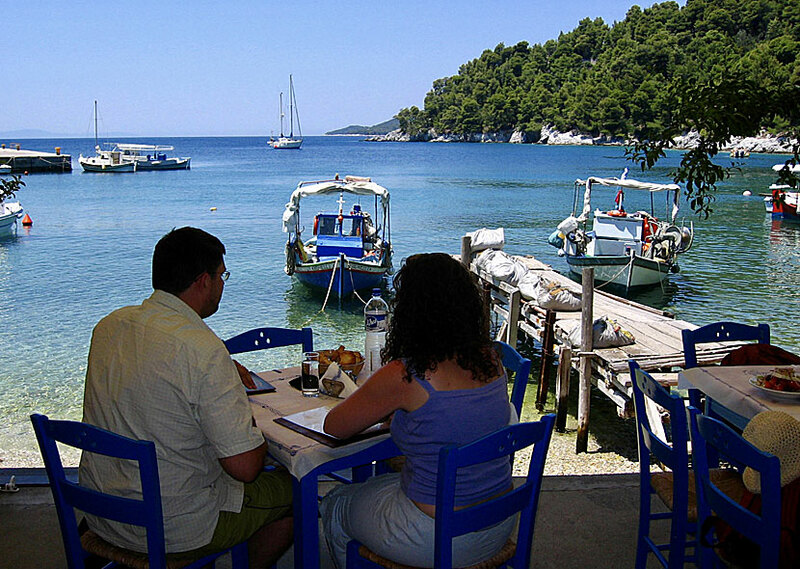 Every time we travel to Skopelos we say that we are going to stay a few nights in Agnontas. But unfortunately it has not happened yet. I can only imagine how it is to eat a late dinner at Taverna Koralli and listen to the waves lapping against the shore, and then wake up in the morning and go to the beach for a morning swim. It must be an amazing experience because the surroundings are incredibly beautiful. One of the tavernas in Agnontas. As I said, I have not lived in Agnontas and therefore I have no tips on good accommodation. So I refer to booking.com where there are a few pensions to choose from.